The Ministry of Industry and Trade has attempted to explain why the country has imported coal despite a large inventory. After years of receiving low dividend payout rate by banks, shareholders of many banks are now happy with the high rates announced at this year’s annual general meetings (AGMs) of shareholders. Prime Minister Nguyen Xuan Phuc has requested that the policies for Vietnam’s three special economic zones stand out so as to drive the development of these units. The Ministry of Finance has proposed a tax on houses depending on their construction value as part of a draft law on property tax. The Vietnam Association of Motorcycle Manufacturers (VAMM) has reported that in the first quarter of 2018, its five members – Honda Vietnam, Suzuki Vietnam, SYM Vietnam, Piaggio Vietnam and Yamaha Motor Vietnam – sold 803,204 motorbikes of all kinds, up 1.9 percent from the same time last year. Viet Nam’s cement industry saw strong growth in cement exports in the first quarter of this year as many Chinese cement factories shut down due to pollution and power shortages. More than 100 scientists, researchers and practitioners from 12 nations are taking part in the three-day International Conference on Sustainable Development of Civil, Urban and Transportation Engineering (CUTE) 2018, which opened in HCM City on Tuesday. The Ministry of Agriculture and Rural Development (MARD) along with the Vietnam Farmers’ Union (VFU) and Vietnam Cooperative Alliance (VCA) have signed a coordination programme to implement the National Assembly’s target of having 15,000 agricultural cooperatives and cooperative alliances operating effectively by 2020. Vietnamese start-ups have invested US$129 million in fintech and the industry is forecast to continuously attract heightened investor interest next time, according to the Ernst & Young (EY) ASEAN FinTech Census 2018. DBS Bank and OCBC Bank are among a group of banks and lending agencies that have signed off on financing of about US$1.87 billion ($2.45 billion) for a controversial coal-fired power station in Vietnam. Many banks have recently cut deposit interest rates by 0.2-0.4 percentage points against earlier this year in the wake of good capital mobilization amidst the credit slowdown. 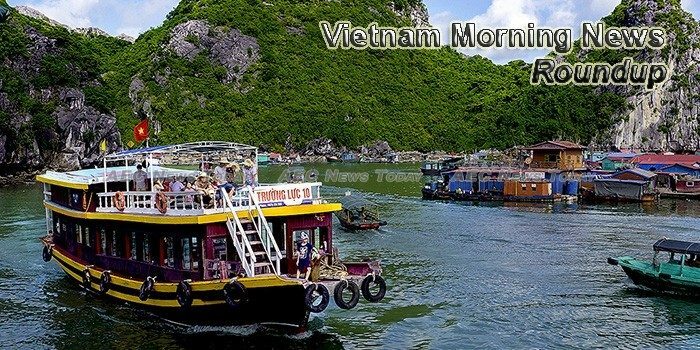 Vietnam’s tra fish exporters can still access the US market despite the US Department of Commerce (DOC)’s imposition of high anti-dumping duties on Vietnamese tra fish, said Secretary General of the Vietnam Association of Seafood Exporters and Producers (VASEP) Truong Dinh Hoe. After 10 years of negotiations, the US market has opened up to certain fruit varieties from Vietnam, including star apples, mangoes, dragon fruit, longan and lychees. The Ministry of Finance has suggested increasing environmental protection taxes to the maximum level in a draft resolution it is compiling for the National Assembly’s Standing Committee, which has caused mixed opinions. Workers collect, classify and recycle all kinds of waste just to earn a little bit extra. As investors from the Republic of Korea (RoK) have financial strength, management experience and high technology, Vietnam wants them to actively take part in and become strategic partners in the equitisation and divestment of State capital from State-owned enterprises (SOEs). Two enterprising Vietnamese men under thirty years old have established a company offering convenient smart call centers to firms after determined efforts of becoming successful based on business ideas. The Ministry of Transport expects to collect at least 2.235 trillion VND (98.45 million USD) from the sale of more than 371.53 million rights to buy preference stakes in the Vietnam Airlines Corporation. Lotte Group has revealed their plan to start building a smart urban complex, including an iconic tower, worth US$884 million in Ho Chi Minh City later this year. Samsung Vietnam co-operated with the Ministry of Industry and Trade to organize at the opening ceremony of the training programme for Vietnamese consultants in the field of Manufacturing Innovation and Quality Improvement.